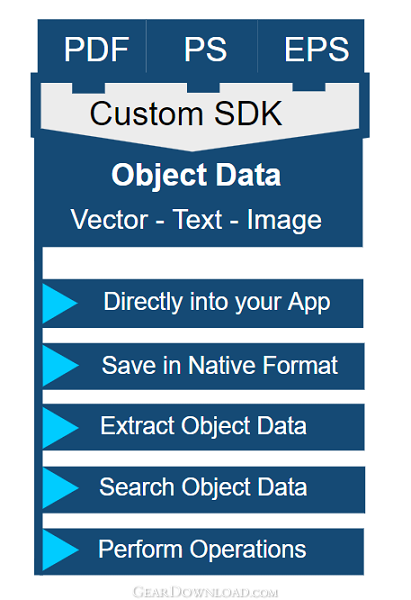 Some examples of what you can do include: Extract object data on each PDF page, Support your application's native file format, import object data without a conversion step into your application, Search object geometry data, Find text object strings, Perform operations on object data, Delete object data, Change attributes of object data, Extract image objects such as, for example, JPEG files, Snapping to PDF. Limitations: Watermark is printed on all output. Licensing removes this control. This download (current-flysdk.exe) was tested thoroughly and was found 100% clean. Click "Report Spyware" link on the top if you found this software contains any form of malware, including but not limited to: spyware, viruses, trojans and backdoors. Excel ActiveX 2.4 - Excel ActiveX enable you to create and interact Excel document rapidly! EazyCode - .Net Code Generator 7.1.70 - Generates ready-to-use and easily extendable, database driven applications. Iron Speed Designer 12.0.0 - Iron Speed Designer generates Web and Mobile applications in record time! Word Viewer OCX 3.2 - Word Viewer ActiveX enables you to create and interacts Word document rapidly! Unicode Controls for VB6 4.0 - Unicode Controls and Classes for VB6 - Turn your VB6 into an Unicode Machine!